Connor Scully and Yolanda Wilkinson in Bible Study for Heathens. BOTTOM LINE: A funny and politically pointed jab at the sexism, homophobia, and material indulgences of ten major religions. 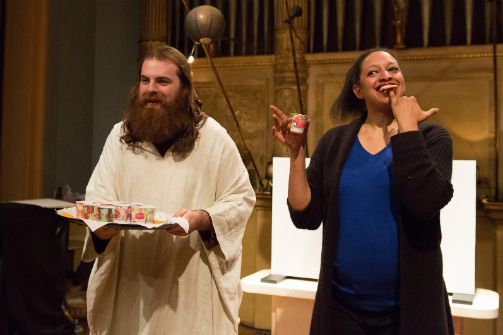 As the audience enters New York City’s Judson Church—well-known as one of the City’s most progressive religious institutions—and climbs the stairs to The Loft, they are greeted by a robed monk (Connor Scully) who points them to a table. Small piles of sand cover the small slab. A few inches away cups of granules in a variety of colors sit in wait. As the barefoot monk invites the guests to add a personal flourish to the evolving mandala, some walk directly to their seats while others stop to contribute. By the time actor Yolanda Wilkinson enters the room, many hands have added to the motif and as Gregorian chants fill the space the mood is reflective and serene. But it doesn’t last long. These dueling feelings are unsettling to Wilkinson. After all, she asks, can God be present in those who are hateful? Can a bigot embrace the divine? They’re serious questions, but Wilkinson is a masterful storyteller and she weaves hilarious and incisive digs into the account of her personal exploration of 10 religions: Baptist, Catholic, non-denominational Christian, Hindu, Messianic Jewish, Presbyterian, Scientology, Transcendentalism, and Wicca, among them. As she describes her forays into each faith, puppets and images projected onto a screen are used to embellish the narration. In addition, audience members are periodically asked to sing, read, and partake in rituals. For her part, Wilkinson frequently walks among the spectators, making eye contact, shaking hands, and making this less a production to observe than an interactive experience. What’s more, as you’d likely expect, despite its abundant humor, Bible Study for Heathens has more than a few intense moments. Indeed, when Wilkinson describes the pain of losing both parents within two months of one another, followed by her grandmother’s death several years later, it is not surprising to hear her admit that she “told God she hated Him.” Nonetheless, she came to understand that grief is as ephemeral as a sand mandala, and despite numerous encounters with charlatans and hustlers, at their core she discovered that all religions are the same. In fact, when the philosophies of the world’s major religions are parsed for their most essential tenets, the faithful do not need either a place to worship or a leader to guide their way. Instead, she explains, they need to follow one simple rule: Do unto others as you would have others do unto you. Bible Study for Heathens is written and performed by Yolanda K. Wilkinson. Directed by Joey Rizzolo. Stage Manager is Nikki Castle. General Manager is Kyra Sims. Projection Designer is Cara Francis. Lighting Design is by Sarah Livant. The cast is Yolanda Wilkinson and Connor Scully.